The WORCESTER PARK Blog :: Power to the people? 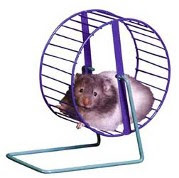 Clearly that hamster-in-a-wheel that supplies EDF energy to Sutton, Worcester Park and Cheam is not at all well as there was yet another power outage last night around 6pm. This time it was just out of the confines of Worcester Park in the no-mans land that is known either as North Cheam or the A217. I prefer the latter. Meanwhile in Worcester Park the lights were dimming intermittently, so there is clearly trouble't'mill. Perhaps those wind turbines in The Hamptons aren't such a bad thing after all?